Once the TUIO server application is running then any application that is a TUIO client should respond to touches. The NetCat command can be used to view data on the TCP / UDP port configured for TUIO. TUIO is a bit odd in that the client and server nomenclature are reversed. The TUIO client is actually a UDP server waiting for a connection, and the TUIO server is actually a UDP client connecting and sending data to a UDP server. The addition of '-l' means that it will listen for data as a server (i.e. like a TUIO "client" would) instead of attempting to create a connection to a server. 4.In the TUIO_JAVA folder, open TuioDemo.jar. A window should appear with the title "TuioDemo" which should display touches. This demo program was written in-house to test our UPDD TUIO server and is available here. 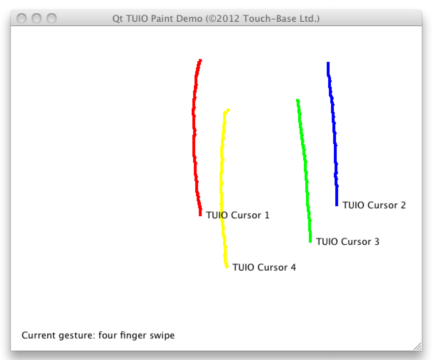 In this example the TUIO server has been loaded and the QtTUIOTouchDemo program listed to turn off mouse emulation when top most so that only the TUIO touches are recorded: The calculated gesture is also shown. 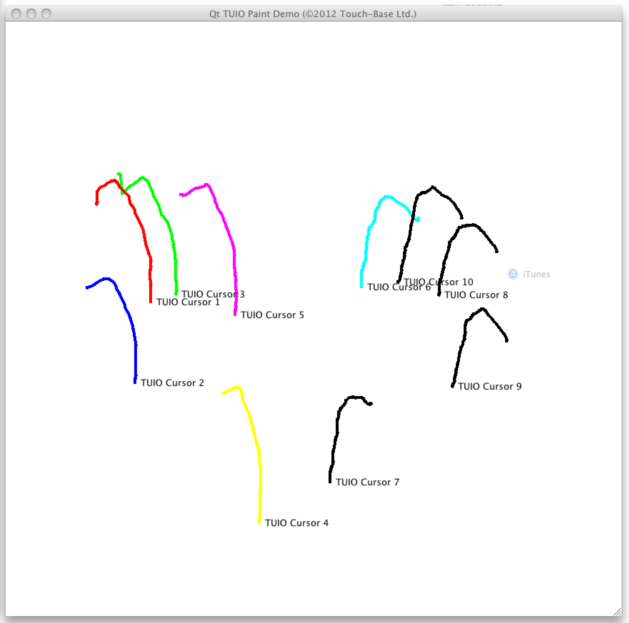 An example of 10 touches can be seen here.